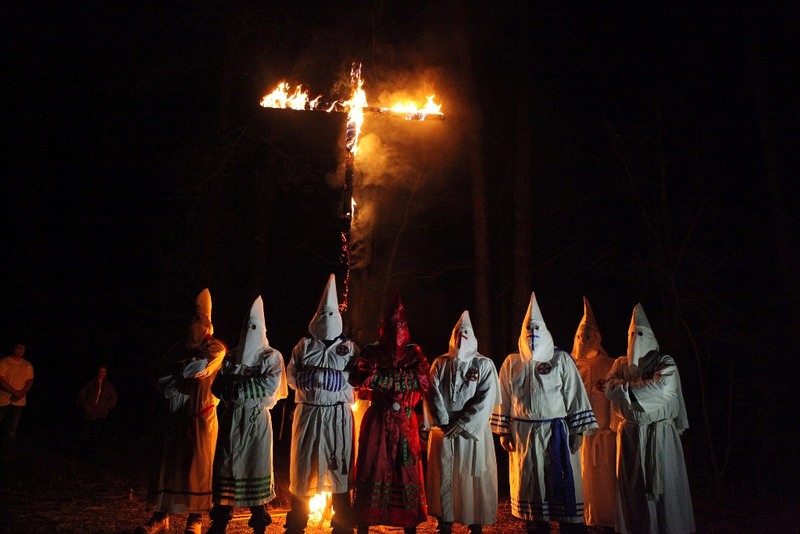 A cross-lighting ceremony that took place near Tupelo, Mississippi, in late March following a Ku Klux Klan rally in Memphis, Tennessee, that was organized to protest the renaming of three parks in the city built in honor of the Confederacy. It is a “cross lighting,” not “cross burning,” because these Klansmen “do not burn, but light the cross to signify that Christ is the light of the world.” Photo by Robert King. In collaboration with Robert King, chief editor VICE USA, Rocco Castoro, who wrote the story “The Wizard of the Saddle Rides Again”, about the Ku Klux Klan rally and a planed counter rally by the CRIPS in Tenessee, curated the KKKRIPS exhibition (that, of course, features Robert’s photographs of the KKK and Crips). The exhibition also includes showings of Triple Hate, a documentary co-produced by the pair and hosted by Rocco. He and Robert frequently do things they probably shouldn’t, but that’s mostly because they get bored easily. Video screenings of material from this shoot will be shown at an evening in the festival when Rocco and Robert discuss multimedia formats and strategies for photojournalists and puiblishers with Mischa Bruinvels (World Press Photo) and Wolf Böwig (Black.Light Project) on June 14th. The article in full length on VICE.COM.